Virgin Galactic's mothership, WhiteKnightTwo, on a test flight from the Mojave Air and Spaceport in California. 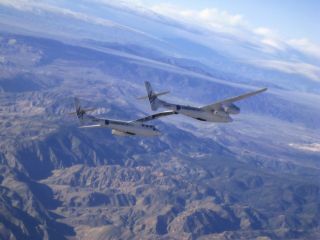 A carrier aircraft for Virgin Galactic's commercial spacelaunch system completed its longest and fastest test flight to date onWednesday. That marked the third flight for WhiteKnightTwo, whichhad its maidentest flight at the end of last year. The twin-fuselage aircraft flew for morethan two and a half hours, reaching a maximum speed of 161 mph and an altitudeof over 18,000 feet (3.4 mi). WhiteKnightTwo is slated to carry SpaceShipTwo as part ofa reusablespaceliner fleet designed by aerospace veteran Burt Rutan and his companyScaled Composites. The world's largest all-carbon-composite aircraft bears thename "Eve" in honor of the mother of Sir Richard Branson, Britishentrepreneur and founder of Virgin Galactic's suborbital space tourismbusiness. "Now the stratosphere is the limit as we willcontinually test Eve for the next few months up to her ceiling of above 50,000feet," said Peter Siebold, test pilot for WhiteKnightTwo during its firstthree flights. Siebold conducted many tests during WhiteKnightTwo'sthird flight that were meant to raisethe bar on altitude and flight-duration, but also addressed technicalissues including in-flight engine restarts and engine thrust asymmetryassessment. The all-carbon composite aircraft has a U.S.coast-to-coast range, and is slated to support up to four dailyspace flights, night or day. It could also potentially launch an unmannedrocket capable of putting a satellite into low-Earth orbit. Tourists would pay a price tag of $200,000 to get a briefride into space (at least 62 miles above Earth's surface) on the two-pilot,six-passenger SpaceShipTwo. Virgin Galactic has previously stated its intent toconduct test flights with WhiteKnightTwo carrying SpaceShipTwo in the secondhalf of 2009. "I am looking forward to flying myself in Eve in thenext few weeks before we attach SpaceShipTwo later in the year and begin testflights to space shortly afterwards!" Branson said.